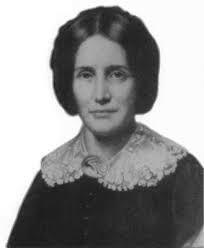 Juliette Kinzie chronicled Chicago’s early history in personalized accounts, with highly stylistic literary flourishes, ultimately resulting in the publishing of her book Wau-Bun: “Early Day” in the North-West in 1856. Kinzie, who married into the family of one of Chicago’s first family of white settlers, captures in this book the social and cultural interactions of early Chicago among the white traders and trappers arriving in the area, and the established Native Americans who struggle to coexist, and at times resist, these newcomers. It is generally viewed that Chicago’s literary history begins with Kinzie’s writings. Today I spent about ten contemplative minutes sitting on a bench in the shadow of the Chicago Water Tower amidst the hustle and bustle in the center of the Magnificent Mile. I imagined how life must have been in the area when the Water Tower was built in 1869, when it was called the Chicago Water-Works Tower. There would be horse and buggies on the street, not cars. A completely different world! Back then, Michigan Avenue north of the river was called Pine Street, and a large ice rink provided amusement for the skaters on the corner of Pine and Superior. Despite Wilde’s negative opinion of the tower, I will come back again and sit in its shadow, where I will be comforted by its permanence on the city’s ever-changing landscape. Chicago born and bred, Margaret Ayer Barnes was a novelist, short story writer and playwright. She began her writing career in earnest after a debilitating car accident at age forty in 1926. Two of her plays, Age of Innocence (adapted from the Edith Wharton novel), and Jenny each played for more than a hundred performances on Broadway. Her novel, Years of Grace, which spans over a period of four decades, was the winner of the Pulitzer Prize in 1931.